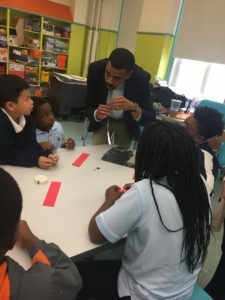 ReadBoston, in partnership with Reading Is Fundamental, celebrated the power and excitement of reading with a Book for Ownership celebration event for the third grade students at the Holmes Innovation School on September 21, 2018. At the book celebration event, “The Boy Who Harnessed the Wind” by William Kamkwamba and Bryan Mealer was read aloud. Holmes third graders were inspired by this incredible true story. As a young boy in Malawi, Kamkwamba’s village suffered a terrible drought. After exploring science books in the library, he built a windmill to generate electricity to pump the water they needed to farm their land. As part of the Books for Ownership program, each participating student chose 3 books to take home and own. The event concluded with the students participating in a STEM based project where they made LED Bookmarks. 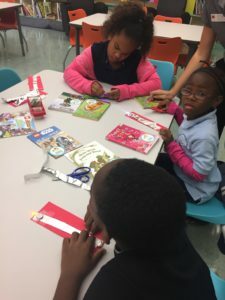 The Books for Ownership program relies on a simple yet fundamental truth: if you allow children choice and access, they will be more engaged readers. 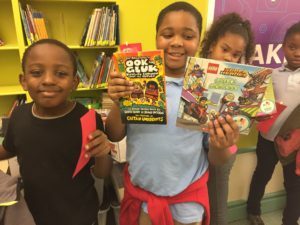 Over 40 million children nationwide have had the opportunity to experience the power and excitement of the Books for Ownership program, and we are thrilled to inspire young readers!